Speaking to VentureBeat, Reggie Fils-Aime claimed that the Wii U’s controller wasn’t influenced by the iPad, explaining that they began development on the Wii U before tablets became the phenomenon they are now. VentureBeat: Were there some developments in the air that also influenced the design, such as the popularity of the iPad? 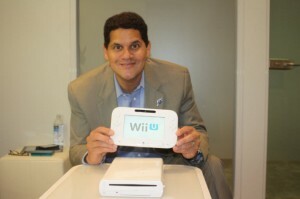 Reggie: We were well in development before the the birth of tablets and, again, to be clear, this is not a tablet. It is a connected experience to the base console. It talks with the base console. It interacts with other Wii accessories whether that is a Wii Remote Plus or a Wii Balance Board. So it has very different functionality compared to a tablet. He also makes it clear that the controller wasn’t even designed as a tablet, citing the lack of an integrated microprocessor in it as the way they plan to keep its cost “low.” The entire interview is quite interesting, actually, as it gives some insight into the design philosophy behind the Wii U, and Nintendo’s approach to revealing it. I’d recommend reading the rest of it. I have nothing against the iPad and its sibling electronics or anyone who enjoys them, but in all honest…….I think it would be a waste if the WiiU Remote was anything like the iPad. Despite having nothing against the i-products what so ever, I still personally don’t care for them at all……not even a little. So these people who keep largely comparing the two have absolutely no say in my view on the console. That’s just how I am, I could care less what others have to say unless I actually see it their way….and their arguments won’t help at all, I’m just too solid to let others opinions cloud my own.